IDC EDB to PST Software convert inaccessible exchange file to PST outlook file with extract EDB emails, contacts, calendars and etc. EDB to PST Converter auto detects.edb location and scans all issues to fix them for making smart EDB to PST Conversion process. This free EDB to PST Recovery Software generate complete preview of scanned EDB file items that you can open to read its content and finally more towards convert EDB file to PST, EML, MSG, HTML and EMLX format. MS Outlook Installation required and supports MS Outlook- 97, 2000, 2002, 2003 to 2016. EDB Email recovery by message filtering option- it allows save emails between two selected dates. Newly developed Free EDB to PST Converter Software which satisfactorily recovers all emails from exchange contacts folders, calendars, task, notes and other user mailbox items to convert EDB to PST Outlook file without altering data. EDB to PST Recovery Software conveniences users convert either complete folders/ items of EDB file OR convert selected folders/ items from exchange EDB file into several kinds of formats such as- PST, EML, MSG, HTML and EMLX format. Recover EDB to PST along with facility of splitting oversize PST File by define size upto 5GB during conversion. 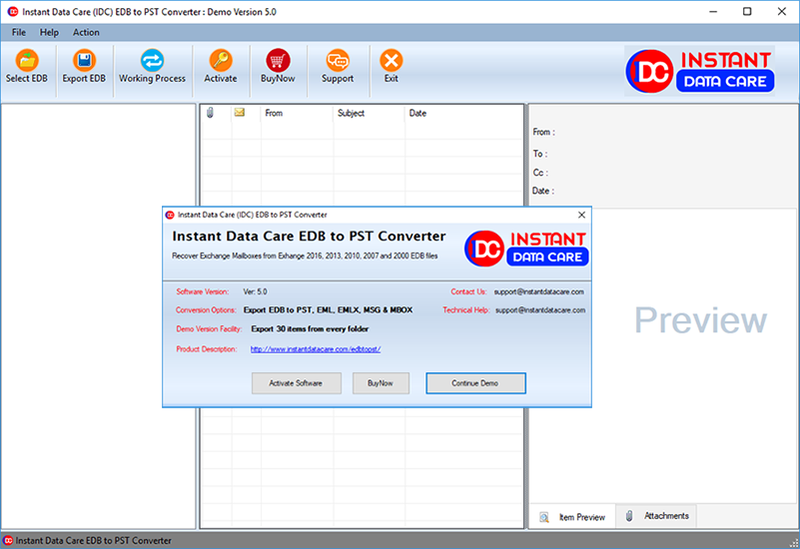 IDC EDB to PST Converter Software take out all emails from damaged Exchange file and convert EDB to PST Outlook file with emails properties and attachments. Users don’t require to have MS outlook installation on their machine for installing free EDB to PST Software for making conversion of exchange file database into PST and MSG format of MS Outlook application. EDB to PST Converter Software provides big opportunity for repairing inaccessible exchange (priv1.edb) and (pub1.edb) file & convert all repaired users mailboxes folders to new created PST file. This EDB to PST Recovery Software generate live preview of emails/mailboxes conversion process only to makes users satisfied from conversion items of exchange file. 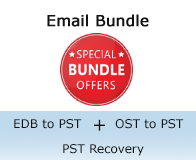 EDB to PST Recovery is the complete solution that let users convert single and multiple mailboxes from dis-mounted exchange file to PST and another format. EDB to PST Converter Software supports offline conversion of exchange server database to MS Outlook file with extract every mailbox components such as- emails, contacts, calendars, task, notes etc. Here updated feature of the EDB to PST software makes users capable to save all individual emails of exchange file into different kinds of formats like- PST, EML, MSG, HTML and EMLX format. All conversion process is safe and secure, without data alteration recover EDB to PST file with this same software that easily supports all MS outlook versions upto 2016. EDB to PST Converter Software gives mails filtering option that totally based upon dates; it means users can pre-define two dates to recover emails and on the right side of the software there a “Extract Attachment” option is available, users can also choose it to recover all the emails which having attachments items without facing any difficulty. Splitting resulted PST file is the most beneficial facility for all MS Exchange users because during migration process the users can choose “PST Split” option for making larger PST File in small PST File size by define size from 1GB to 5GB. This process is safe and there no risk of data losing without thinking more you can take advantages from this feature that is totally free. Supoprted Exchange Server Version: IDC Exchange EDB to PST Export Software recover edb mailboxes from Exchange Server 2016, 2013, 2010, 2007, 2003 and 2000 files. I need to convert individual emails from Private folder to PST and MSG format so can use EDB to PST Software for this? Yes, you can download and install this EDB to PST Converter Software which capable to save individual emails from priv1.edb file & pub1.edb file to PST and MSG format with maintains all data integrity. Do I need to have live exchange server to make conversion of corrupted exchange file to outlook file? 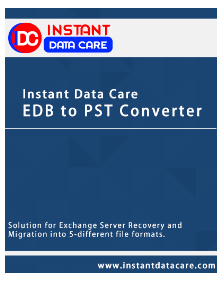 No, you don’t need to have live exchange server environment because this EDB to PST Converter software works in offline mode to solve all corruption server issues and capable to convert offline EDB to PST and MSG format. How to use the EDB to PST Recovery Software of your company I am fresher and I’m not a part of IT field? Using this EDB to PST Recovery software is very easy, our software GUI process having easy steps of conversion and this is promise; you won’t face any difficulty during EDB to PST Conversion process. How many formats, your EDB to PST Software provides for recover EDB file?? This EDB to PST Converter software provides several formats that supports different type of emails client’s application, you can convert EDB to PST, EML, MSG, HTML and EMLX format. Is there any size limitation of EDB file for doing conversion into PST Outlook file? No, there no size limitation has been mention you guys can browse any size of EDB file for conversion data into PST and other format. Can i get some discounts on? For discount, please contact to our sales or support team, they will assist you about discounts and promotion.